J/News Articles: Claudia Rossi Crowned J/70 European Champion! Claudia Rossi Crowned J/70 European Champion! (Kiel, Germany)- The second J/70 European Championship saw ninety-six boats from fifteen nations sail eleven races over the four day series in everything from stormy weather with epic planing conditions to sunny days with benign, shifty breezes. 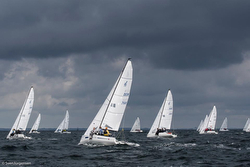 Kiel YC hosted the regatta with racing taking place in the choppy waters of the southern Baltic Sea called the Schilksee. 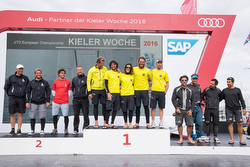 It was a very talent-laden fleet, with multiple European and World Champions in over a dozen classes participating, including the Deutscher Touring YC- winner of the 2015 Deutsche-Segel Bundesliga. 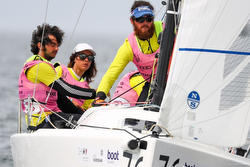 The surprise winner of the event was top Italian woman skipper Claudia Rossi and her PETITE TERRIBLE crew of Matteo Mason, Simone Spangaro and Michele Paoletti. Claudia sailed an amazing series, she scored all top five finishes and, in fact, tossed a 5th place to score just 29 pts net in ten races- a remarkable 2.9 average! Because of the size of the fleet, the 96 teams were split into four flights that would rotate after each race in order to race each other with 48 teams on the starting line. 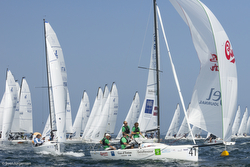 After the first race day of racing, several southern European teams were dominating the standings. Stefano Roberti’s PICCININA from the YC Monaco J/70 fleet was at the top of the leaderboard after posting a smoking-hot 2-1-1 scoreline. They were followed by two Italian crews- Carlo Alberini’s CALVI NETWORK (1-2-2) and Claudia Rossi’s PETITE TERRIBLE (1-4-2). The best German crew was in tenth place- Sven-Erik Horsch team from Norddeutscher Regatta Verein in Hamburg. Claudia Rossi was hoping to follow the same successful path in Kiel that her father did two years earlier. In 2014, her father, Alberto, won the ORC Worlds in the outer fjord with his boat ENFANT TERRIBLE. Evidently, Claudia has the same competitive fire in her blood as her Dad! In fact, Alberto himself flew to Kiel on Thursday to cheer on his daughter. For the J/70 sailors, it was a late one on the race area on their second day. In the light and shifty breezes, the race committee managed to start two races, before the wind finally disappeared when they were trying to start the third race. So PRO Thorsten Paech decided to send the crews back to the dock. The leaders of the fleet changed, with Rossi’s PETITE TERRIBLE taking the lead with a 1-5 compared to Roberti’s PICCININA with a 4-6. For many in the top ten, it was the fifth and last race of the day that saw some dramatically bad races posted on the scoreboard. Oliver Schwall, sailing BROTHERHOOD (founder of German Sailing League), was coming to terms with the idea the teams from the Mediterranean had a higher speed potential. "In the national sailing league we are sailing with basic settings on the J/70, which we are not allowed to change. You immediately notice that these other teams know how to set up their boats better." Oliver was sailing with his brother Rene, Bo Teichmann and Moritz Jaeger-Roschko (all members of Kieler YC). At the end of racing on Day 2, the only German crew in the top ten was the team of PIT FINIS with tactician Karol Jablonski on board (a DN iceboat World Champion and Match-Racing World Champion). The third day appeared to have an enormous effect on the points table. In the first race for the Blue fleet over 30 boats were disqualified due to an early start. And several crews were subsequently judged OCS in other races. But, staying clear of trouble was Ms Rossi’s crew on PETITE TERRIBLE, as she continued her winning ways with scores of 1-4-4 to become the unchallenged leader of the fleet. The biggest leaderboard climbers on the day were Eduardo Lupi’s TORPYONE from Italy (3-5-2) and Charlie Esse’s BABY J from the U.K. (4-9-3), both sitting on the provisional podium at 2nd and 3rd, respectively. Also, sailing “lights out” all day in hyper-kinetic mode was Brazilian Mauricio Santa Cruz on MANDACHUVA (4-1-2) with the best record of the day in the entire fleet to catapult them into 5th place overall. The regatta finished with a packed program of three races. And the weather on the race course made it a perfect day, after difficult wind conditions and a huge number of disqualifications had caused lots of turbulence in the highly competitive class. By sailing a perfect series of races on the final day, Roberti’s PICCININA counted three victories to end up taking the silver while Gonzalo Araujo from Spain posted a 2-1-5 to vault into the bronze medal to finish off the podium. Rounding out the top five were Lupi’s TORPYONE in fourth, suffering from having to throw out a Black Flag in the last race, and in fifth was Santa Cruz’s MANDACHUVA. J/133 JUMP Coming to America! J/22 Warrior Sailing Program- need trailer! 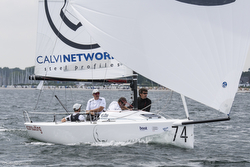 J/111 Crowned New England PHRF Champion! JELVIS Clinches J/111 European Championship! J/109 Wins Volvo CORK Week Regatta! Wyman Crowned J/70 West Coast Champ! Vineyard Cup Fun & Games! J/160 PIPE DREAM Bahamas Bound! Giving Back to Veterans- Learn to Love Sailing! Giving Back to the Sport You Love- Sailing! Great Sailing @ Cleveland Race Week! Sailing in Chile- the Grez Family Excels! J/122 MOONSTRUCK Wins St Kilda Challenge! J/70 AQUAHOLIKS Wins Chicago NOOD Overall!